At Dame2Salsa we offer Cuban rueda (Cuban style salsa danced in a group) classes for several levels over 3-month intensive periods. All classes are one hour and are held once a week. These cuban rueda classes are taught at Progreso Musical, near Argüelles metro in the center of Madrid. Instructions are given in Spanish, but English explanations can be given upon request. Regular classes are 8€ per class and paid monthly, meaning that the total per month will depend on the total number of classes in that month. Bear in mind that, as we mentioned in “Our classes”, the registration for our courses is closed most of the year. Now, however, you have the chance to sign up as registration for April-June started on March 1st. This is the planned schedule for the April-June course. Don’t hesitate to send us a message if you are interested about joining. Group 1: Tuesdays from 9 to 10 p.m.
Group 1: Tuesdays from 8 to 9 p.m.
Group 2: Wednesdays from 9 to 10 p.m.
Group 1: Thursdays from 9 to 10 p.m.
Group 2: Fridays from 9 to 10 p.m.
Thursdays from 8 to 9 p.m.
Mondays from 9 to 10 p.m.
Group 1: Mondays from 8 to 9 p.m.
Group 2: Wednesdays from 8 to 9 p.m.
Fridays from 8 to 9 p.m.
We will open registration for additional level 4 and 5 groups if the aforementioned groups become full. Please remember our groups are small (max 14-16 students), but these new groups will need enough students signed up and a balanced number of leads/follows. Making up classes: If you are going to miss a class, it is mandatory to advise your teachers beforehand. In levels with more than one group per week, you will be able to make up the class with your same level that week. This will give you the advantage of not missing your class! However, if your level has only one group, you can only make up the class in a lower level. Level 1: If you have never danced, this is your course as we start from the very beginning. If you have danced salsa but not rueda (especially if you are dancing as a lead) we also suggest you to sign up for this level. Level 2: If you have danced cuban salsa or rueda and you know the basics (dile que no, enchufla, 70, etc. ), start here. Also if you took salsa classes even if not cuban salsa. 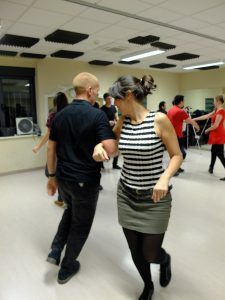 Level 3: If you have danced cuban rueda and you are able to perform most basic moves with ease, this is your course, as we start to focus in good-looking rueda moves. Level 4: A course where we do a little less rueda, focusing instead of variations of partner moves, making up series and musicality. Level 5: A course dedicated almost entirely to casino and rueda de casino, with some other difficult cuban rueda moves. Level 6: Difficult partner and rueda moves, casino and musicality. You cannot sign up for this one, only work your way up from lower levels. Everybody can join level 1, but in order to join any other level, a placement test is necessary. The next test will be held in March, kindly check our Events. 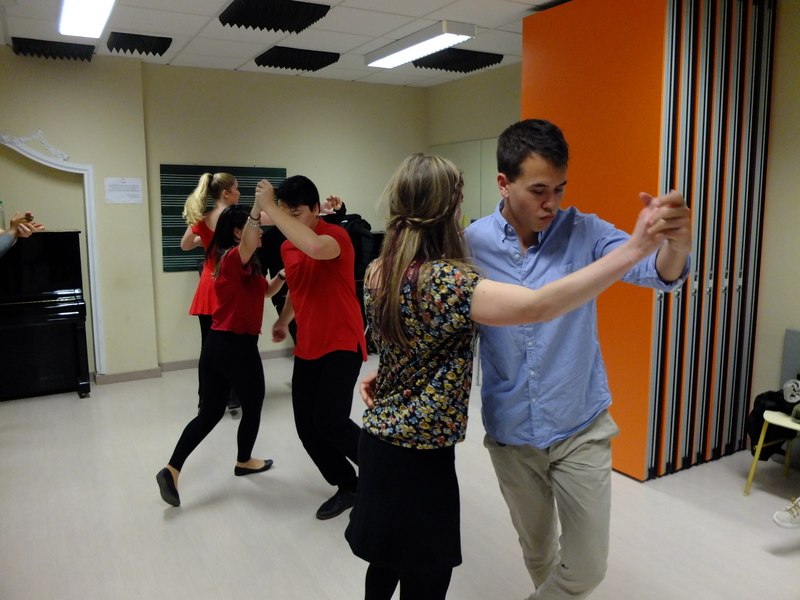 From time to time, we do single-subject courses dedicated to other dances or a particular group of salsa moves. These courses are normally are shorter in duration (offered over a day or week) and we publish them on Facebook.